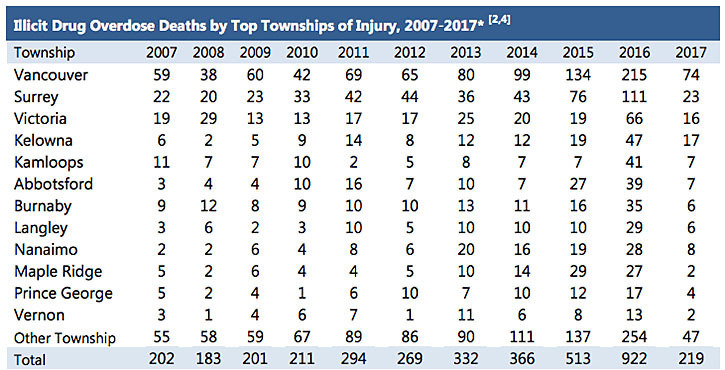 Vancouver, Surrey, Kelowna saw the highest number of deaths. Mar. 17, 2017 2:00 p.m.
More than 100 British Columbians died because of an illicit drug overdose last month. The latest numbers from the BC Coroners Service on Friday showed 102 people died in February because of a suspected overdose. That’s down from the 112 deaths recorded in January, but is still an average of more than seven deaths every two days. The highest number of overdoses were recorded in Vancouver with 29 people, followed by Surrey at 14, and Kelowna at 11. Most of the deaths – 89 per cent – occurred inside, with more than half in private homes. No deaths were reported at the overdose prevention sites since they were set up in Surrey, Vancouver, and Nanaimo in November. “People need to be encouraged to visit these sites, as the majority of deaths are occurring when people use illicit substances without medical attention or assistance nearby,” Chief coroner Lisa Lapointe said in a news release. “While I’m very relieved to see that the numbers have not continued to increase over the last two months,” Lapointe added, “we are still losing cherished members of our communities at a terrible rate.